One of the most important pieces of academic or professional writing you may ever need to tackle is your resume. Unfortunately, few people are taught how to write a high-quality resume that gets them noticed. 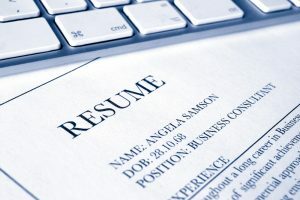 Instead, many people tackle resumes like they would any other academic writing assignment, only to discover that these cookie-cutter resumes do not result in any interviews or phone calls. Other people resort to gimmicks to try to get their resumes noticed. From sending in resumes on pizza boxes to using unusual colors in paper or outrageous fonts, people try anything they can to make their resumes stand-out. However, you do not want your resume to be memorable because it is unusual or difficult for those making hiring decisions to read. Instead, you want your resume to be memorable because it is well-organized, easy-to-read, and highlights the skills you have that make you the best choice for the job opportunity. This is where our resume writing service can help you with landing a job. A resume refers to a document that people use to present their backgrounds and skills. It is sometimes called a curriculum vitae, but there are some differences between a traditional resume and a traditional curriculum vitae. Generally curriculum vitae are longer and go into greater detail about your skills and experience, but for some types of jobs, you may be expected to provide a curriculum vitae rather than a traditional resume. It is also different from a cover letter. A cover letter is a brief introduction, where you not only talk about why you are qualified for the job, but also why you want the job. Format is important in a resume and essays are generally going to be prepared in one of several acceptable professional formats. Look at some example resumes and you will see that the information is not presented in chucks of sentences or paragraphs. Instead, it is presented in an easily digestible format. Think of your resume as being made of rows and columns of various sizes. The columns in each subsection may be broken down into categories such as time period, institution or organization, job title, and job description. Each row will typically focus on one job or other experience, such as volunteer or educational experience. Why are essays such a challenge for people, even established writers? The main reason is because resumes are different than academic writing. In a resume, you have to market a commodity and make sure that it stands out above the competition. What makes this such a challenge for people is that you are the commodity and it is very difficult to walk the line between self-promotion and bragging. Many people who tackle their own resumes find themselves down-playing accomplishments, which gives prospective employers an incomplete picture of you as an asset. At Student Network Resources, our freelance writers have been helping people write eye-catching, industry-specific resumes since 1998. While much has changed since then, including a lot of hiring practices, our writers have kept up with those industry changes and the overall changes in the hiring market, to ensure that our customers know how to effectively market themselves to potential employers. In addition to providing resume services, we also help customers with other parts of the job search. We can write custom-written cover letters, which flesh out the details provided in a resume and help explain why you are the perfect candidate for the job. We can write your profiles for LinkedIn or other networking resources, as well as any industry-specific websites where you can promote yourself. Our team or writers can help you create an overall image that sells your skills to prospective employers by incorporating all of your experience and highlighting your professional and academic connections. • Handled all aspects of lease administration including renewals and terminations in commercial, residential, and industrial spaces. • Planned special events for tenants. • Responsible for lease administration in several commercial and private properties. • Supervised onsite and offsite maintenance crews. • Took service requests, prioritized work orders, and dispatched service for tenants of residential and commercial buildings. • Supervised repair and remodeling in residential and commercial properties. • Developed budgets based on prior fiscal year expenses and planned expansions. • Handled accounts payable and receivable. If you have looked at custom resume services, you may have been shocked by their prices. Quite frankly, we are, too. For skilled resume writers, taking your qualifications, tweaking them to make them marketable, and presenting that information in an appealing professional format is a relatively basic request. We work with some of the best freelance writers in the business, which means we can offer those services for a fraction of the prices you will find at some of our competitors. For a basic one-page resume for someone transitioning from student-to-work life, you can expect to pay $18. Want a custom cover letter that you can adapt for various job opportunities? Then, you can expect to pay $36. You will not find a better combination of high-quality and low-prices from any resume service on the internet! At Student Network Resources, we have been helping clients with their resumes for almost two decades! We have helped many customers transition from students to employees or move up the corporate ladder as they transition from position-to-position or change employers. Try our resume writing service and learn how to market your experience and skills so that you can get the job you want.